She ended up with 150,000 in tax debt and as you probably know it’s pretty much impossible to file bankruptcy on Uncle Sam. What’s worse is all the consumer protection laws that apply to most private collectors go out of the window when it comes to the government. My uncle (at the time) advised her to call curadebt. They got the IRS to accept $10,000 out of $150,000 since it was clear she couldn’t repay that debt. Curadebt is a debt relief company that was established in 2000 and based out of Hollywood Florida. It was started by a team that had been helping people out in California since 1996. This is my honest curadebt review. They offer debt settlement and tax debt relief services. I considered them when I was being rained on by a financial storm in 2008. 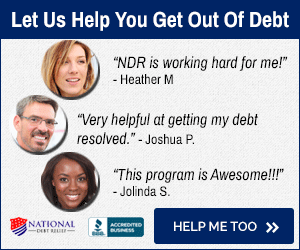 Personally I chose National Debt Relief as I felt it was the best option for me because CuraDebt didn’t have a license to operate in my state (Texas) at that time. That being said Curadebt would be an excellent choice and they charge about the same anyway. Their tax team has over 100 years combined experience working on tax issues and over 83 years working for the Internal Revenue Service (IRS) and state tax agencies. Curadebt is a member in good standing with the American Fair Credit Counsel . In order to be a member of AFCC, a company has to follow a stringent set of requirements, disclosures as well as maintain them through continual review. How much does CuraDebt charge? Does Curadebt have requirements for their services? Can afford to make a minimum $250 per month payment to the special savings account but remember that’s in lieu of payments currently being made to creditors. *They can help with these things in certain cases. Get this special phone number to get directly to a human and see if yours is one of them. Yes Curadebt helps with taxes! The one thing I really really liked about Curadebt is that they can also help consumers with tax debt. Most debt relief companies steer clear of uncle sam. Curadebt has tax professionals that can assist you in a few ways. Offer in compromise-Just what it sounds it like an offer in compromise. This is basically a debt settlement where the IRS agrees to accept less than what you owe. This is tough to get so it is probably best to have a professional (either curadebt or an attorney if you can afford one) do this for you. Help you set up installment agreements (although you can do this yourself) your curadebt counselor will set up an installment agreement with the IRS or State agency so you can make affordably payments until your tax debt is repaid. Penalty abatement-This is where the IRS agrees to reverse or ‘abate’ penalties that have been tacked on to your debt in exchange for payment in full. This is also available on an installment agreement. Collection Statute Expiration Date-This is the government’s statue of limitations which are basically a set of laws stating how long the government has to try to collect the debt. Most of the time its 10 years. After that they legally can’t go after you for the debt anymore even if you do owe it! Tax Lien Subordination-This is where the government will put a lien on your property or some other asset to recover the money owed. The debt settlement process is relatively simple. With Curadebt the debtor (you) will have to deposit a certain amount that you and the company agree to in a special account. Once your balance reaches a certain level they will begin contacting your creditors and offer a lump sum settlement. The reason most creditors accept is because they would rather get a portion of their money back instead of taking a charge off. The process usually takes anywhere from 24-48 months. During that time they are supposed to help you send cease and desist letters to the debt collectors so they stop harassing you. Yes you can. The difference is hopefully you’ll only have to do this once in your life where as your creditors do this on a daily basis. Who do you think has the advantage? With a debt settlement company that specializes in this sort of thing you’re likely to get a more favorable result. i.e. more debt forgiven! The curadebt tax team has over 100 years combined experience with over 83 of it previously working at the IRS or other taxing authorities. Curadebt is a solid company dedicated to helping consumers and small businesses get out of the crushing burden of debt. I called these people after I called National Debt Relief. They were good as well. But can you tell me are they BBB rated as well? I couldn’t find anything. Also the account maintenance fee do you think it is worth it for their services? I’m trying to decide between the two but I’m still not sure yet. Some more guidance would be appreciated!